Photographer: Heather Bays of Winnipeg, Manitoba, Canada. Getting the Shot: It was two in the morning and we were drinking cheap beer after a delicious steak BBQ—yes, Argentina really does have the BEST steak in the world! It was the middle of summer so it was very hot outside. I was lying on the floor of the balcony at the Locomotion Hostel in Cordoba, Argentina. I was attracted to all the colors surrounding me. I lay there looking through the viewfinder with my finger on the trigger waiting for someone to walk by. As soon as he did, CLICK. The Details: I was using 3200 ISO so I could get a shutter speed low enough to blur but high enough to freeze. We love the sense of place this dynamic photo captures (mental note: bookmark the Locomotion Hostel for our next jaunt to Cordoba). Think your own picture is good enough for Global Eye? Add your photos to our Flickr pool. Photographer: Patrick Barry Barr, a Jamaican living in Lima, Peru, following a detour of 30 years in the U.S.
Getting the Shot: For several weeks, as I taxied south along Paseo de la República, a major highway near central Lima, I would see graffiti on the wall of a building on the elevated local street. I noted the cross streets in the vicinity and, recently, took a bus from Breña, where I was staying. I walked the five blocks to the building, braced myself against the rail across the street and waited for breaks in the traffic to take the wall that I had been seeing. It was when I went onto the side street that I saw this delightful piece of art for the first time. After taking the photo, I rang the bell—for two reasons. Could they close their doors that were slightly obscuring the art just for one minute, and would they happen to know the artists? I was rewarded on three levels: Yes, they closed the doors. Then, the location turned out to be a ceramics manufacturing center. And, finally, the son of the proprietors is the artist, Pessimo. First, I met his mother, Lala Higuchi, who, like her husband Oswaldo, is a ceramist. Under the title inmigrantes, an exhibition of his work is currently in the Galeria Ryoichi Jinnai at the Centro Cultural Peruano Japones. 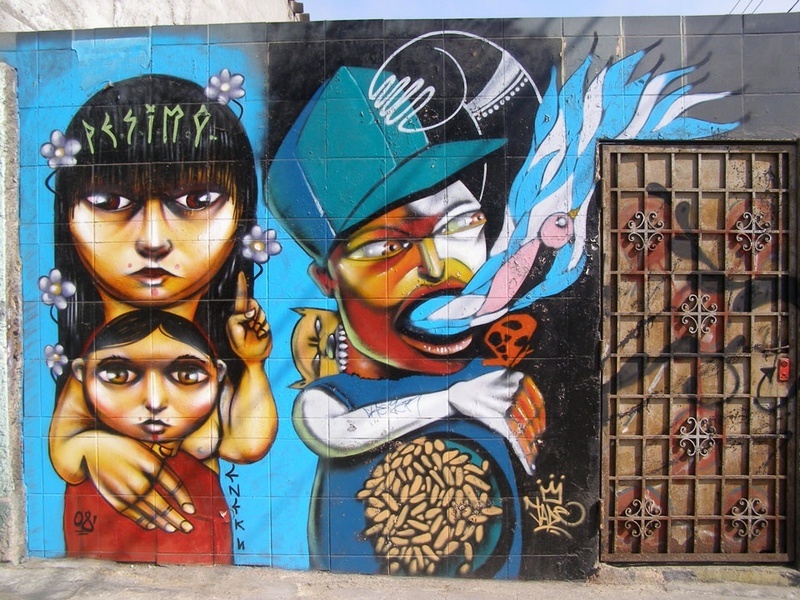 Lima ranks next to New York City as far as quantity of graffiti that I have shot. And quite often the graffiti will rise to the level of what I have seen in New York, Milan, Barcelona, Victoria, B.C., Canada, among other countries. This is the only country where I have stayed long enough to actually spend time with graffiti artists as they bomb a wall or walls on any given weekend. The graffiti culture here is highly developed. The Details: The light was perfect, since I arrived in the afternoon and found the sun behind me. I leave my camera on auto so it actually does the thinking while I do the composing. The photo was taken with an Olympus SP-500UZ, 6.0 Megapixel. I stuck with Olympus because my first one fell about four feet onto the concrete floor of a store in Budapest, if memory serves, and didn’t miss a beat. Continued to work like a charm. For more shots like this one, check out Patrick's 18 sets of photos of graffiti worldwide, and join our Flickr pool for the chance for your photos to be featured on our Global Eye feature. Getting the Shot: The photograph was taken on Takaosan (Mount Takao), which is located in Hachioji City on the western end of the Tokyo Metropolitan Area. Mount Takao is a relatively rare natural area just about one hour by train from central Tokyo. There are a number of hiking trails, as well as a cable car to its peak, which is 599 meters (1,965 feet) above sea level. There is a Buddhist temple called Yakuoin near the peak. The Details: On the day that I took this photograph, the temple was celebrating its annual Grand Autumn Festival. As part of this festival, the temple priests lead a procession up the mountain to Yakuoin Temple. As is typical with events of this type in Japan, there were numerous photographers jockeying for position to get the best picture of the Buddhist priests in their colorful ceremonial garments. As the procession neared the temple, I got a little tired of all the jockeying and wandered around the compound where I found this oasis of peace and quiet. 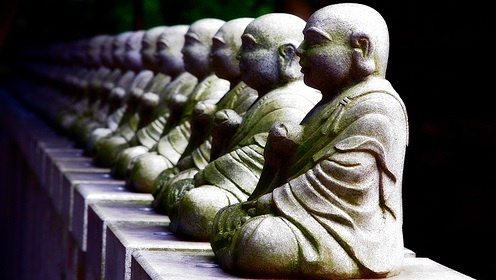 This photograph makes us want to find our own inner Zen. Have you got photos that are worth of Global Eye? Add them to our Flickr pool. "My Shadow on the River"
Getting the Shot: I took this photo on the banks of the North Saskatchewan River on Leap Year Day 2008 using my Leica C-LUX 1 point-and-shoot camera. Although the scene looks like it could be in one of Alberta's more remote regions, it is actually in the heart of downtown Edmonton, a city of more than a million people. A fluke of geography, the river's steep banks made it impossible for developers to build along the river, and so the whole river valley was turned into an elaborate park system, nearly 16 miles (25 kilometers) long. This particular spot is on a popular off-leash dog park. The Details: I'm a Southern girl, originally from Arkansas, and this was my first winter in Canada. Needless to say, after months of dark days and -40-degree temperatures, I came down with a bit of cabin fever. But on this particular day, the sun was radiant, and so I stole the opportunity to head out-of-doors. I shot for hours along the river, taking advantage of the long sunsets we have in the North this time of the year, and it really raised my spirits. In particular, I was tickled to discover the strange split-beam house perched on the bluff. I saw so many houses like this one when I lived in Bavaria last year, but I never expected to find one in Edmonton. It was a pleasant reminder of my happy time in another beautiful corner of the world. Now that spring has officially sprung here in D.C., we're fully aware our pleasant afternoons of mid-70s and 80s will soon make way for the sticky heat of our infamously sweltering summers. In an act of repression and denial, we offer this quiet scene of winter reflection. Think your own picture is good enough for Global Eye? Add your photos to our Flickr pool. Photographer: Kat Tancock, Toronto, Canada. Getting the Shot: I took the photo in mid-March at the Vernisazh market in eastern Moscow (also known as Izmailovo Park). The Details: It was a bright day and I was taking advantage of the bright colours in the stalls with my Canon SD750 point-and-shoot camera. 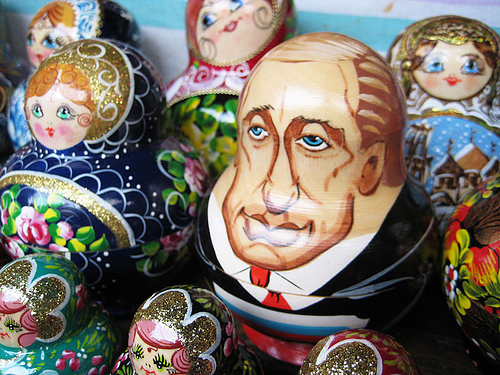 I loved the juxtaposition of the Putin doll with all of the standard matryoshki. We love how this picture helps sum up how tradition and politics mingle in Moscow. No doubt there's a few riddles hidden inside the Putin doll. Photographer: Vahid Jahed, from Minden, Nevada. Getting the Shot: The photo was taken at the Palace of Fine Arts in San Francisco in 2006. I wanted to take some night photos there. A few swans, accustomed to being fed, approached me and one actually pecked at my camera as it was sitting at the water's edge. The Details: I used long exposure to capture the background and the built-in flash to capture the swan. We like the way that Vahid managed to make a make a traditional landmark shot unique. Think your own picture is good enough for Global Eye? Add your photos to our Flickr pool. Getting the Shot: Well you know the saying "the grass is always greener on the other side of the fence," right? 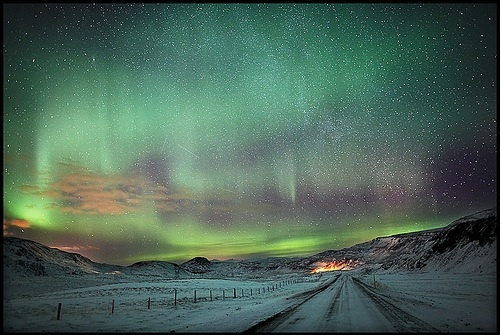 Here in Iceland the borealis is pretty common from late September to early April so if you just bother going out night after night, you are bound to eventually stumble upon some to photograph. Only trouble really is having patience, a lot of nights are spent not seeing any borealis. That and making sure to have something else but borealis in the shot, like an interesting foreground. We like how Larus captured several shooting stars in the midst of the colorful sky. 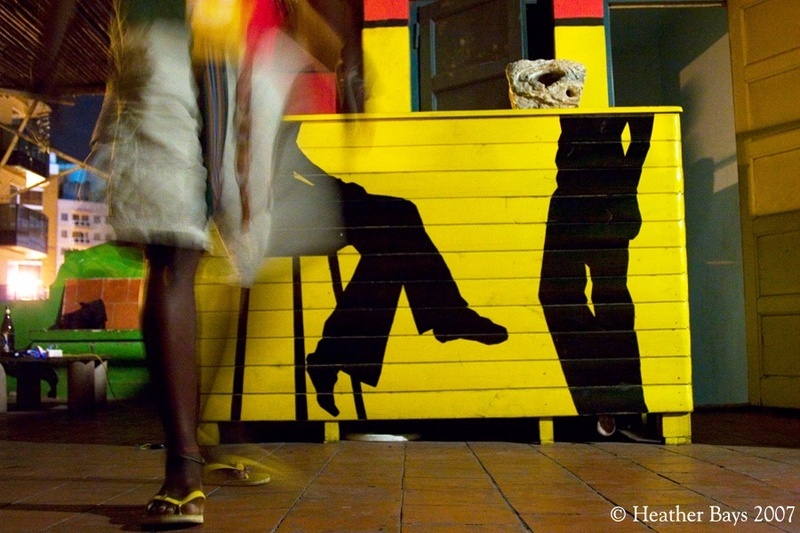 Have you got a photo that is worthy of Global Eye? Add it to our Flickr pool. And got some love for IT writer Katie? Vote for her essay on Reykjavik over at Gridskipper. Getting the Shot: Years ago, I remember walking around side streets all day trying to find the best shot of the Seattle Space Needle. After fruitless attempts, I decided to ride the elevators up to the top. By the time I was done for the day and leaving around dusk, I looked up at the tower and shot this picture. We love how Lola managed to make the street lamp seem more otherwordly than the Space Needle behind it. What do you think? Send us your own photos for Global Eye by adding them to our Flickr pool. Getting the Shot: In November 2006, I traveled to Israel with my church. At the time I only had a point-and-shoot Kodak DX4330. The Details: After a day of traveling, we ended with a walk down the Via Dolorosa in Jerusalem, Israel. As a group we wound through the narrow and crowded street. Vendors lined both sides trying to sell trinkets and souvenirs, food and clothing. One store caught my eye; its beautiful colors seemed to fall from the sky and surround us. 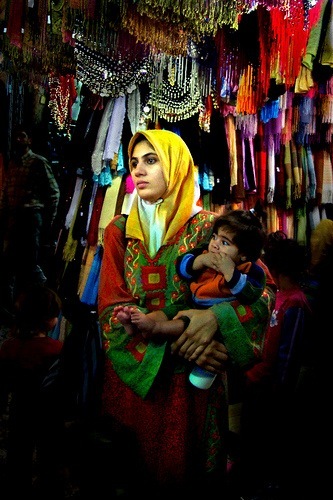 Emerging from the colors was a young mother, who had been shopping for a head covering. What an experience to see these colors of life! We love how the colors emerge from the shadows, and the focus in her eyes. What do you think of the shot? Want to be included in Global Eye? Contribute your photos to our Flickr pool.